The Kio Kit is a digital education toolbox enabling schools in emerging markets to access online educational tools for better learning. The Kio Kit is a ready-to-use box of digital education tools designed for schools in low-income communities. The kits come with 40 Kio tablets, pre-loaded with engaging educational content which is divided into three key sections: academic content aligned to the local curriculum, games that stimulate critical thinking, and content focused on responsible citizenship and environmental conservation. Along with the tablets, the Kio Kit includes a BRCK wireless router designed for mobile use even with unreliable electricity and internet access. The BRCK router also has solar charging capabilities and a lockable case. Designed to be user-friendly, particularly for children, the tablets do not require individual cables for charging. Instead, they are simply placed back into the Kio Kit which charges them wirelessly. With financing, the Kio Kit can be purchased for as little as $250 per month. After launching in late 2015, Kio Kits have already been deployed in six countries. Digital access in education means that a child’s curiosity is not constrained by the four walls of her classroom, by her teacher’s training, or the textbooks in her school. Nivi Sharma – President, BRCK Education. Sixty-one million children in Africa lack access to quality education, often due to lack of learning materials and qualified teachers. 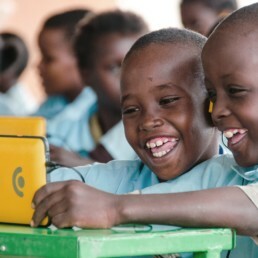 Providing schools in low-income communities with the Kio Kit addresses these issues and enables students to use new technology and the internet to access learning opportunities. The Kio Kit can help educate low-income groups and provide them with digital skills that will enable them to create better livelihoods. The Kio Kit provides an affordable and fun educational tool to enhance classroom experiences and improve education. BRCK Education provides a holistic education technology solution that turns every classroom into a digital classroom.